The pre-birthday Saturday which Amy put together continued well after kayaking. She, Libby, and I headed to lunch at one of the Phantom Gourmet’s newest “hidden jewels” – the Dudley Chateau, where my friend Erin surprised me! 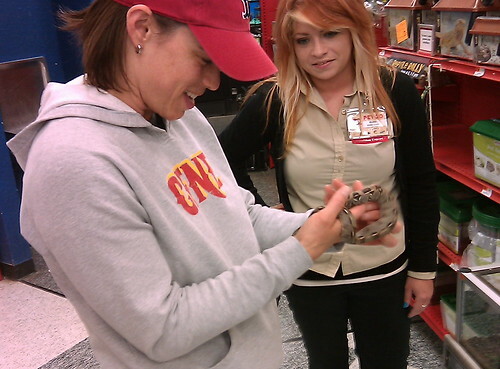 After a wonderful lunch of burgers and beer, Erin headed off to do Saturday things, and Amy and Libby drove me to the local Petco, where employee Kerry was more than happy to let me hold a baby red boa constrictor (his name was Chester). For the entire year, Amy has been offering to catch one of the many garter snakes that live in our yard for me to hold, and for the entire year, I’ve been turning her down. After holding Chester, I finally figured out why: garter snakes are fast and unpredictable in their movements. Baby boa constrictors are not. They are quite deliberate, slowly exploring while twisting and twining. I knew that at any given moment, giving the snake back to Kerry was an option. Not so with garter snakes. 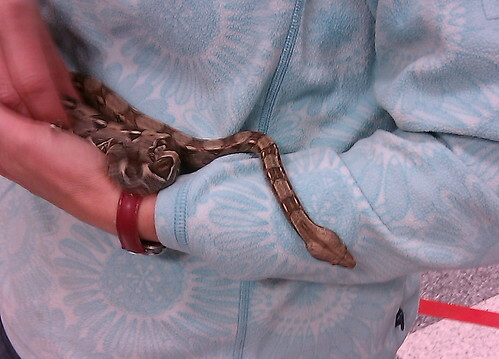 Libby had the chance to hold the snake too. Fun times! Amy, given her experience with our local garters, declined, having actually picked up and moved snakes quite recently.